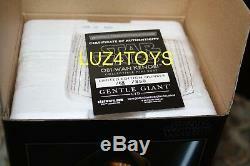 This listing is for a 2017 PGM EXCLUSIVE GENTLE GIANT OBI WAN KENOBI BUST WITH LIGHT UP SABER. T his Bust was a 2017 PGM Exclusive and limited to 850 Worldwide. In this 1:6 scale mini-bust we see Obi-Wan Kenobi, desert recluse and mentor, locked in the fateful duel from the original Star Wars film as he faces down his former padawan on the Death Star. With his hood up, lightsaber ignited and a steely determination in his eyes, Obi-Wan stands his ground against his former pupil and makes the ultimate sacrifice to help save the galaxy. Digitally sculpted by our master artisans, using actual archival footage and designs, each Obi-Wan Kenobi Death Star Duel Mini Bust is rendered using the highest quality polystone, hand painted and includes a light feature imbedded in the bust to illuminate the blade of his saber. Each piece comes individually numbered and is paired with a matching certificate of authenticity. The Edition is #158 of 850. 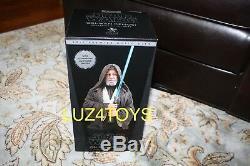 The Bust is Brand New in box (Never displayed) just open to inspect and take pictures. Box is in good condition (See picture). Unless otherwise stated I open and inspect all Collectibles. I will not mark merchandise value below the price paid for the item. Some countries have maximum values that a package can me insured for. Check with your local post office. 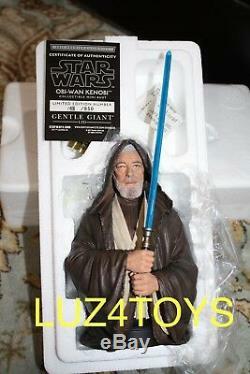 The item "2017 PGM EXCLUSIVE GENTLE GIANT OBI WAN KENOBI BUST WITH LIGHT UP SABER" is in sale since Sunday, August 12, 2018. This item is in the category "Collectibles\Science Fiction & Horror\Star Wars\Products, Non-Film Specific\Statues, Busts, Characters\Other Star Wars Characters". The seller is "cmastand5" and is located in Franklin Square, New York. This item can be shipped to United States, Canada, United Kingdom, Denmark, Romania, Slovakia, Bulgaria, Czech republic, Finland, Hungary, Latvia, Lithuania, Malta, Estonia, Australia, Greece, Portugal, Cyprus, Slovenia, Japan, China, Sweden, South Korea, Indonesia, Taiwan, South africa, Thailand, Belgium, France, Hong Kong, Ireland, Netherlands, Poland, Spain, Italy, Germany, Austria, Israel, Mexico, New Zealand, Philippines, Singapore, Switzerland, Norway, Saudi arabia, Ukraine, United arab emirates, Qatar, Kuwait, Bahrain, Croatia, Malaysia, Brazil, Chile, Colombia, Costa rica, Panama, Trinidad and tobago, Guatemala, Honduras, Jamaica, Antigua and barbuda, Aruba, Belize, Dominica, Grenada, Saint kitts and nevis, Saint lucia, Montserrat, Turks and caicos islands, Barbados, Bangladesh, Bermuda, Brunei darussalam, Bolivia, Ecuador, Egypt, French guiana, Guernsey, Gibraltar, Guadeloupe, Iceland, Jersey, Jordan, Cambodia, Cayman islands, Liechtenstein, Sri lanka, Luxembourg, Monaco, Macao, Martinique, Maldives, Nicaragua, Oman, Peru, Pakistan, Paraguay, Reunion, Bahamas, Viet nam, Uruguay.